Who doesn’t love to receive a great bottle of wine as a gift? Stop in and let us help you chose the perfect wine for everyone on your list. Meza Gift Cards are available in any monetary increment over $10! Need something extra special? We offer customizable and beautifully packaged gift baskets – they make the perfect gift for holidays, showers, weddings, house warming gifts and more! Our gift baskets are packed in beautiful natural wood crates that are made locally and can be reused over and over again by the recipient. Call (614) 259-3101 to place your order during business hours. We are taking custom orders now through Dec 22! 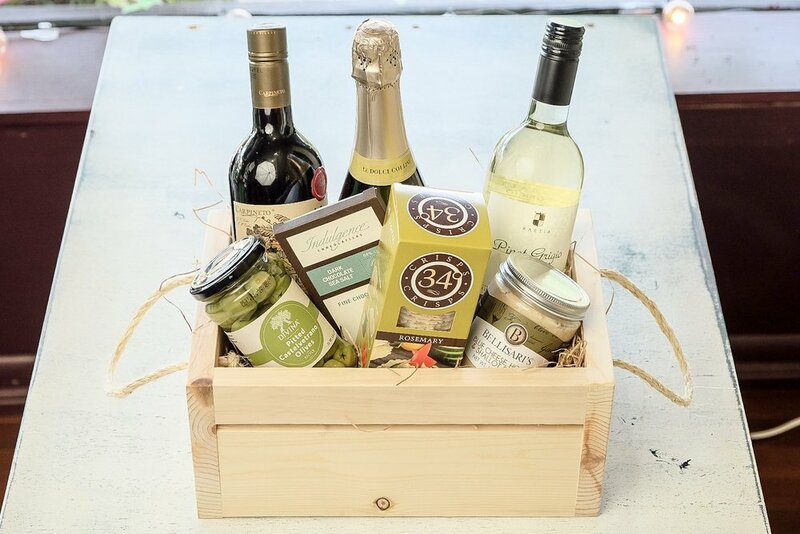 Stop in and place an order on a custom basket and pick up the next day, or grab one of our beautiful pre-made wine gift baskets and be on your merry way! & a Jar of Fig Jam in a locally made, reusable wood crate. Bellisari's Gourmet Spread, Olives, Indulgences Chocolate Bar in a locally made, reusable wood crate. & North Country Charcuterie Salami in a locally made, reusable wood crate.